Today's world is very different than the one us baby boomers grew up in. Marketing was used as an euphemism for selling unless you were academically inclined. Now marketing means data mining and all sorts of clever studies to help manipulate prospects more effectively. Social media seems to many very flighty, but apparently another form of manipulation. Or maybe it is a tool with a life of its own. 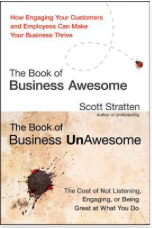 This book is in two sections--one is about being awesome and the other about not being awesome. You can learn something positive from both sections, but the author seems to be catering to the fact that people fall into the two tracks of either starting from positive or from negative. Social media offers new opportunities for businesses to develop customer relations. As Scott points out most businesses know how they should respond to phone calls, but too often ignore social media messages. They should be treated as quickly as possible whether positive or negative. Positive messages should be acknowledged and of course negative messages require serious attention. Often negative messages (complaints) occur on other sites, but can be monitored. Scott used an example of someone I know, Chris Farias who received some poor treatment from a company he was dealing with that started a chain of negative social media. At a more local level Chris was involved in a misleading venture for my family. Chris actually gave out what we all thought was a heavily discounted meal at a local restaurant that turned out to be a big letdown. Chris took it personally and supported us on social media and I notice that restaurant is no longer there. All business decisions seem to revolve around ROI (return on investment). Social media can be difficult to correlate investment with efforts to results, but Scott gives some convincing examples of how it can be very positive. Or negative if you don't do it right. A quote from Scott to remember, "If we don't value conversation we will never see why we need to use social media." Statistics are abundant on social media, but can be misleading. For example someone with 1000 followers may have only 10% online at any given time and only 10% of those will see a particular tweet and when down to that only about 10% of them will click on a link. A tweet or Facebook posting can have a limited shelf life. Although it may take an effort to develop positive relationships online it is very possible to wreck your network with a poor choice of a posting. There are plenty of examples and tips anchored by his philosophy. One of the highlights for me was when Scott was on his way to make another point he revealed Newt Gingrich for the pompous know it all he really is. Scott has been a front line worker and realizes they are often the poorest paid and least appreciated of employees, but represent the company to most consumers. They should be selectively hired, properly trained and above all appreciated. After reading what twitter can do it makes one want to get more involved. There is more to it than learning where people eat lunch.